We did it again! Cindy and I teamed up to make another tasty tasty treat for you guys. Last time we made scones, this time: PASTA! Heck yeah carbs! I rode my bike out to Cindy’s house, then we went on a coffee/grocery adventure before cooking up a spicy tomato sauce, the cutest pasta EVER, and having a lovely lady lunch talking about all things blog and food and snapchat and boys and baby — lady time: The best. Are you guys on snapchat yet? I bring this up for two reasons: first, you should follow both Cindy (cindyishungry) and myself (thekitchenpaper) and you’ll be able to see our cooking expeditions and her cute cute baby Casper! Second, follow katethewasp. She is freaking hilarious, and a while ago got me hooked on #CARBFACE! Like, when you have way too many carbs because they’re delicious and you’re pretty much 100% overloaded on carbs in the most wonderful way. Every time I eat carbs on carbs on carbs, all I can think is: CARBFACE! Oy. I have issues, clearly. This carbface-pasta is not complicated. Not one bit. 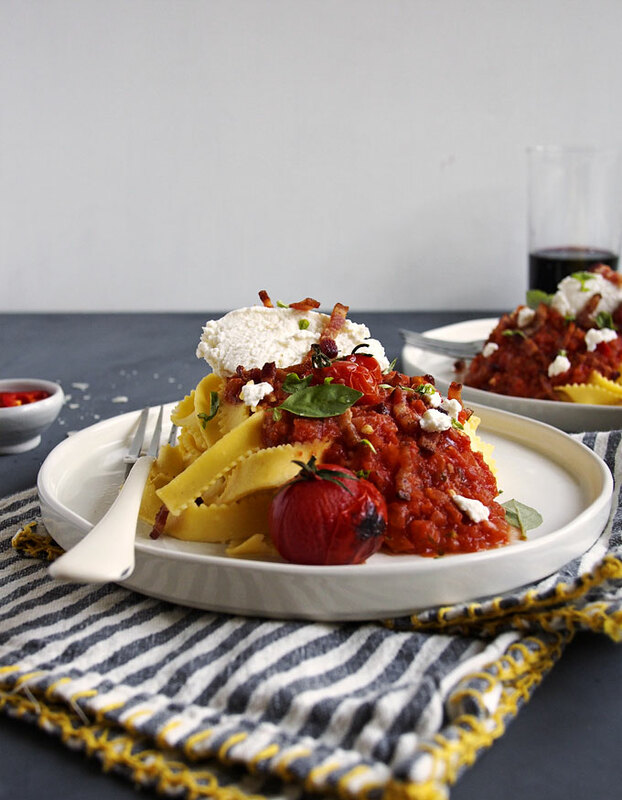 But it has some spicy peppers, crispy bacon, broiled tomatoes, and DOLLOPS OF RICOTTA!! 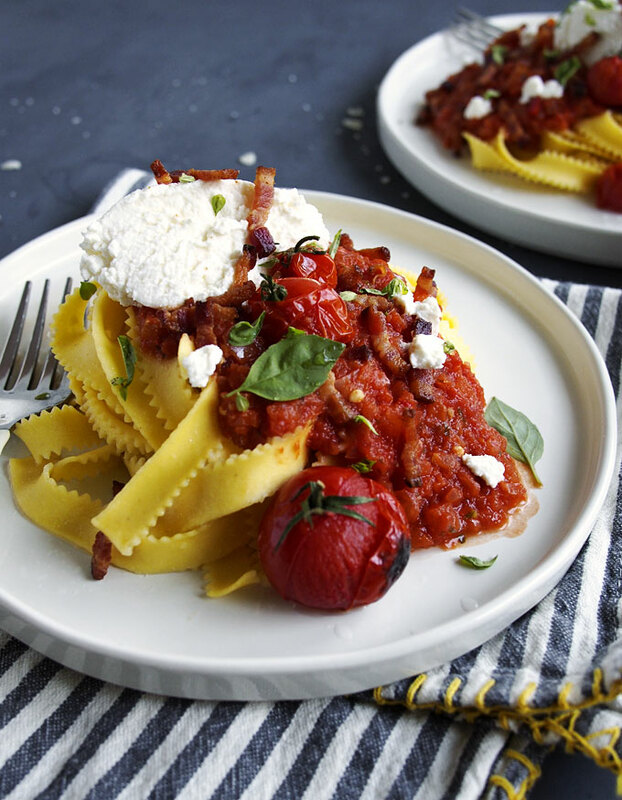 You can’t go wrong with dollops (BIG DOLLOPS) of ricotta! Ricotta is one of those things I usually forget about — like, oh it’s not so special — and then I have some and O.M.G. I fall right back in love. And then I eat it by the spoonful in Cindy’s kitchen and try not to finish the tub before we’re done shooting the pictures. Oops/sorry/notsorry. Go check out Cindy’s beautiful photos of this dish, and show her some love! ALSO: I know I promised chilaquiles today… and I have not forgotten! I just forgot I’d planned to post this today, so chilaquiles coming on FRIDAY! I PROMISE! In a large skillet over medium heat, cook the cut bacon until crispy (but not burnt!). Leaving the grease in the pan, remove the bacon with a slotted spoon and set aside. Add the onion and garlic to the bacon grease and cook for 3 minutes before adding the spicy peppers. Cook for 30 seconds, then add the tomatoes and basil. Bring to a simmer and cook, stirring occasionally, for 20 minutes. While the sauce is cooking, bring a large pot of water to a boil. Add the pasta and cook until al dente. Drain, and toss with a little bit of olive oil to prevent sticking. 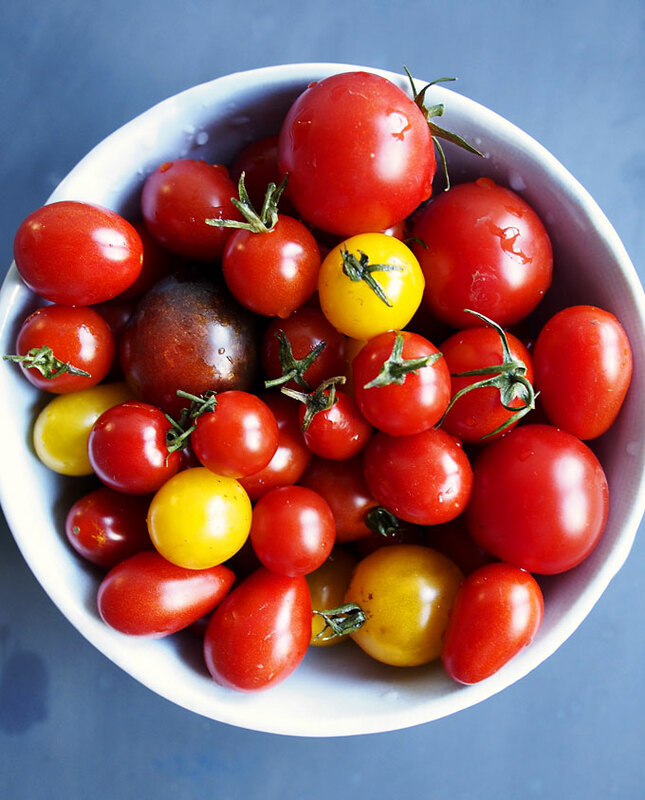 When the sauce is almost done cooking, line a baking sheet with parchment and spread the cherry tomatoes in a single layer. Broil 4″ below the coils until bursting and blackened — about 5 minutes. Remove and sprinkle with coarse sea salt. Season the sauce with salt and pepper, then use an immersion blender to blend until somewhat smooth — we left a few chunks. 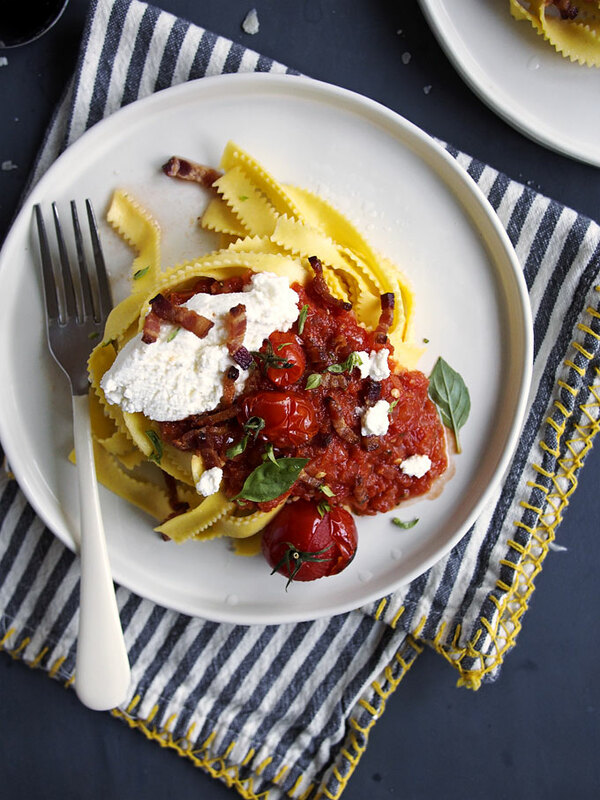 To serve, layer the pasta with a big spoonful of sauce, a few broiled tomatoes, a dollop of ricotta, and the bacon. Garnish with extra basil and parmesan, if you want! Wow! This looks so delicious! I adore Cindy and Casper is adorbs.. I can’t wait to make this bacon pasta goodness. 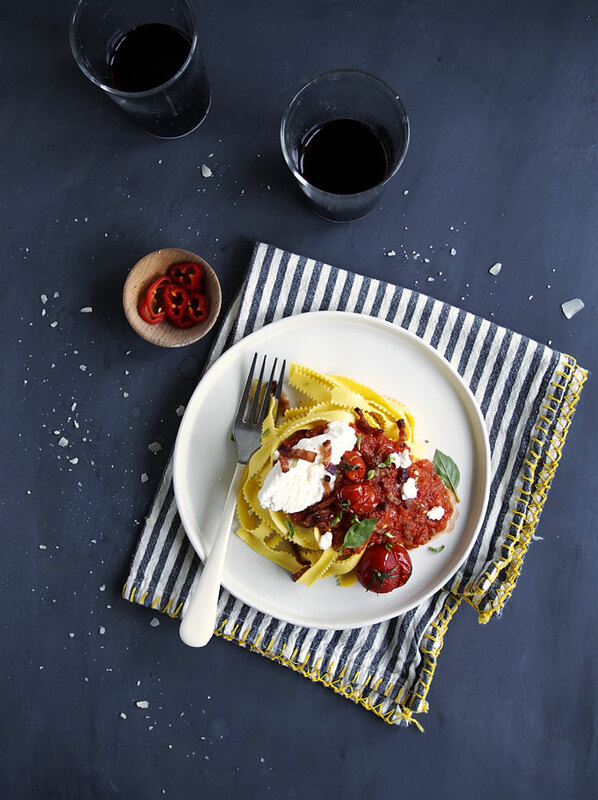 This is pasta simplicity at its finest! And I agree, you can NEVER go wrong with fresh ricotta — pure heaven. I wish that I can go around town with the two of you and eat, talk, and laugh all day! This pasta looks gorgeous!! Um, this looks amazing. I feel the SAME WAY about ricotta! Like, no big deal, until you have a big creamy bite of it mingling with other good stuff. I heart Cindy!! What a great collab! RIGHT!? So good. SO GOOD! Sounds yummy. Thanks for posting this.